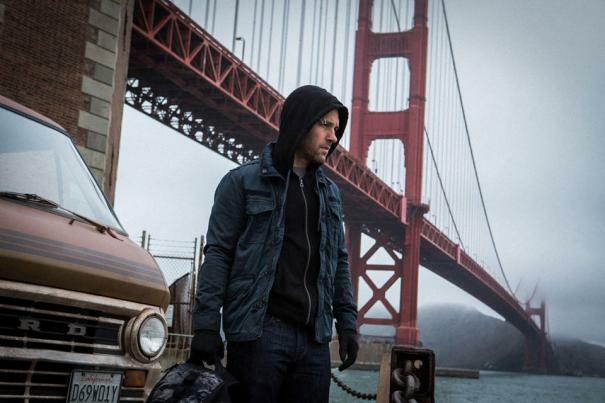 Could Paul Rudd Appear As Ant-Man In A.K.A. Jessica Jones? As the cast for A.K.A. Jessica Jones continues to be revealed, with the lead role having officially gone to Krysten Ritter and that of Luke Cage to Michael Colter, we’re left to wonder who else might make an appearance on the Netflix streaming series, and how the series will connect to the Marvel Universe as a whole. This leads us to one Scott Lang, a.k.a. Ant-Man. Could Lang, played by Paul Rudd in the upcoming Ant-Man movie, appear in A.K.A. Jessica Jones? The short answer is “we have no actual idea,” but there is narrative precedent. In Alias, the Brian Michael Bendis written and Michael Gaydos drawn Marvel Comics series on which the show is based, Jessica Jones and Scott Lang date. The two are actually introduced by a mutual friend, Carol Danvers, who will be featured in her own movie, Captain Marvel, in 2018. Lang and Jones date, he assists her with a case, and then seems to come to a grisly end thanks to the villainous Purple Man. So, as you can see, there’s plenty of room for other Marvel Characters to show up in A.K.A. Jessica Jones. It might be a bit early for us to see Carol Danvers, as she’s not been cast yet and her film won’t come to theaters for another three years, but Lang seems like fair game. Lang’s presence, while not strictly necessary, could add quite a bit to the Netflix series. Obviously, Lang’s involvement allows for some romantic tension as a triangle forms between Jones, Lang, and Luke Cage. Additionally, Lang serves as a great bridge between the epic, big budget superheroes of the Marvel movies, and the darker corners being explored on Netflix, being that Lang is an ex-convict who steals the superpowered technology of one of Marvel’s supergods. Since there’s definitely a place for Scott Lang in A.K.A. Jessica Jones, the real question becomes whether or not Paul Rudd is up for it. This is where things become unclear, because the details of Rudd’s deal with Marvel Studios haven’t been made public. The standard Marvel contract seems to be multi-film, but Ant-Man might be an exception, as the film has no planned sequels on Marvel’s Phase 3 slate. Perhaps, once Rudd begins doing publicity for Ant-Man, the details will start to come out about any future Marvel appearances in the works. In the meantime, could Marvel work the angle in the opposite direction, with Krysten Ritter making a post-credits cameo appearance as Jessica Jones in Ant-Man? We’ll see when Ant-Man opens on July 17. A.K.A. Jessica Jones will premiere on Netflix sometime in 2015.